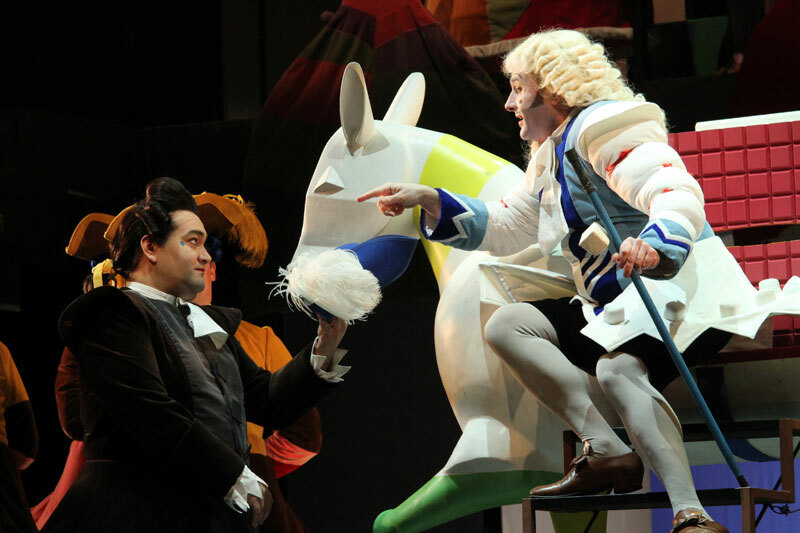 We’re just two days away from the opening of La Cenerentola! 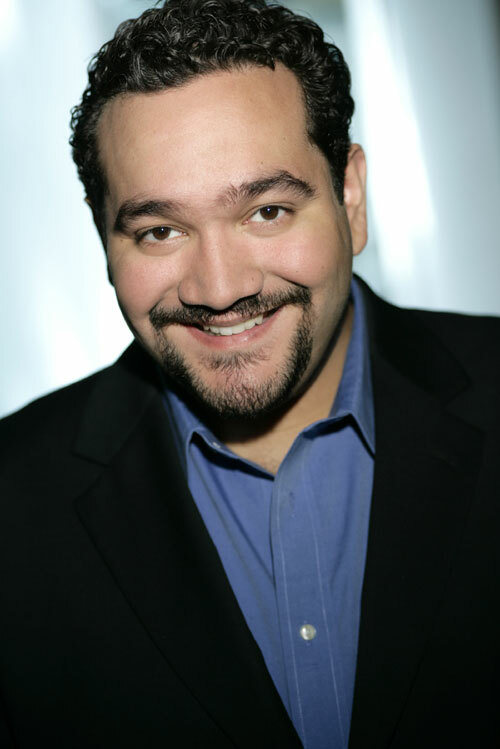 For today’s artist Q&A, we check in with tenor René Barbera, who will make his Seattle Opera debut this Saturday as the smitten Prince Ramiro, who finds his true love when he meets Cinderella (or Angelina, as she’s named in this version). In our chat with Barbera, we discovered that he stumbled upon opera quite accidentally, and never intended to be a performer! Read on to learn how he got his start, and what he loves about this hilarious take on a classic fairy tale. Welcome to Seattle! Can you tell us a little about your background, and how you began in opera? Well, I was born in Laredo, Texas, and I consider San Antonio my hometown (I moved there when I was 9 and lived there until I was 20). And I started with piano, and then ended up singing in choir as a boy soprano. I tried to quit choir when I got to high school, but the choir director knew who I was and he stopped me in the hallway, twisted my ear, and dropped me to the ground and said, “You’ll be in my choir by the end of the week!” [Laughs] Later, when I went to college, I wanted to be high school choir director. So I auditioned and got a scholarship, but everybody began pushing me to do performance. I had no idea that would mean opera; at that point, I’d never seen one. I think I was in five different operas before I ever saw my first one. I didn’t really take it seriously until I was about 23. I was kicking and screaming for a while, because I didn’t think it was something I could really do. Well, I had a bad breakup. And I had been senselessly devoting all my time to this relationship instead of focusing on performing and bettering myself as a performer and singer. So, when the breakup happened, I said, “You know what? I’m going to give myself one week to be upset, and then I’m going to get myself in gear and audition for as many young artists programs as I can.” I think I did seven auditions that year, and they went really well. I ended up at San Francisco Opera’s Merola Opera Program for the summer, and then I went to Florida Grand Opera’s Young Artists Studio for about seven months, and then I left to do Lyric Opera of Chicago’s young artists program. 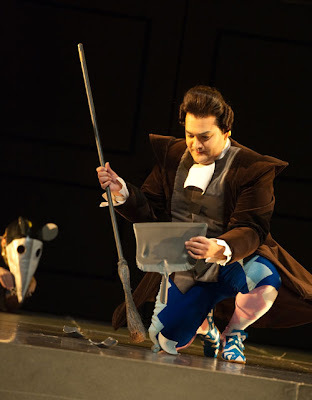 René Barbera as Prince Ramiro in La Cenerentola, struggling in a very un-princely duty: sweeping up shards of a broken bowl. You were reluctant at the beginning, but now that you’ve made opera your career, do you consider yourself an actual opera fan? Yes, mostly. But I don’t really watch opera on my own, recreationally. I think I probably would if I didn’t do it every day, but since it’s work and I’m singing every day of the week, most of the time when I’m off I just kind of enjoy silence. Or something completely different. What do you like most about being an opera singer? Well, there are those who say that the things you’re nervous about doing are the things most worth doing, right? Also, I just have a lot of fun with the people I meet. Everybody seems to be of like mind, and they’re outgoing. My colleagues are really great; I get to have a lot of fun with them. 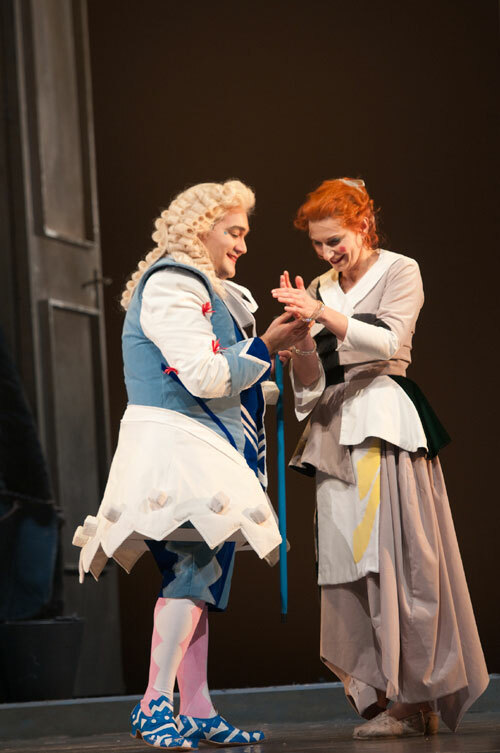 René Barbera (Prince Ramiro) and Daniela Pini (Angelina) in La Cenerentola. Let’s move on to your character in La Cenerentola. What does Prince Ramiro think about some of the other characters around him? Well, Alidoro, I turn to him for all my advice. He’s the all-knowing character, the wise one, and I’m fond of him and I trust him enough to put on this little play in which I swap places with my servant, Dandini. That means I kind of have to curb my own ego a little bit, and allow for my servant to boss me around in front of other people. With Dandini, I think you look at the dynamic between us and see there’s a bit of a friendship there. As for Magnifico, I mean, he’s just a buffoon. He’s completely out there. He’s very crazy and I’m not really fond of him, or his daughters. Or, should say, his biological daughters. As a performer, do you have a favorite moment in this opera? What about your favorite moment to watch, as an audience member? Prince Ramiro (René Barbera) and his valet Dandini (Brett Polegato), in disguise as each other. La Cenerentola opens on Saturday, January 12. Which types of operas do you tend to gravitate toward, tragedies or comedies? I like singing the tragedies because, vocally, they’re very rewarding. You get to let go, you throw in all this emotion, and it’s really therapeutic in a lot of ways. Say you’ve had a bad year, and you get to sing something tragic. Well, then everything gets to come out, and you feel better. (There are some downsides, too, because you can end up overdoing it and hurting yourself.) However, for the sake of acting and performing repeatedly, and the sake of vocal health, I really prefer comedies. They’re just a lot of fun, you get to play around more, and you don’t have to be so serious all the time. Which is your favorite, of each, to perform? Well, I like The Barber of Seville quite a bit. Personally, I’m not fond of Count Almaviva’s serious part in that opera, at the beginning, but I really enjoy when I get to play those character roles like the drunken soldier and the music teacher, and I get to ham it up. As for tragedies, I haven’t done a whole lot of them, but I guess it would have to be Edgardo in Lucia di Lammermoor. It’s a beautiful piece, and it’s a tough sing but a lot of fun. I’m not going to get to sing too much of that stuff because of where my voice is now, but maybe in a decade or so I’ll get to move into heavier, more dramatic rep. I’m in no rush.